First: Contact us about your project we’ll help walk you through your car and make sure the chassis and options will work for you and your project. Second: We’ll send you a quote detailing your project and or special work required. If everything is in line then we move onto a ½ deposit and we will began on or put your build / project in line. Some project will require a greater deposit based on the nature of the project and the parts required, some projects will need to be broken up into multiple payments based on time and length of the project. A contract detailing this information and payment schedule and build will be included. Customers are welcome to come down during the build to inspect their projects during shop hours or with a scheduled appointment during the weekend. Finally: When the project is finished the project must be paid for in full before the project can be retrieved from the shop. Cash or Cashier’s checks in person, Personal checks may be used if the project is being pickup by a shipping company but the project will be held for 10 business days after check has been deposited for verification. Out of country checks require longer certification and projects being picked up may not be paid for with out of country cashier’s checks, please check with us on proper processing. 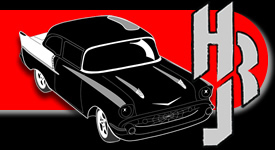 Hot Rod Jim�s warranties all parts built or manufactured by Hot Rod Jim�s. Unless project specifies �final assembly� the customer is responsible for fitment and road worthiness before driving the vehicle. Hot Rod Jims assumes no labiality for your project after it leaves Hot Rod Jims unless it falls into the �manufactured parts� warranty. Brakeage to Hot Rod Jim parts due to failure of other manufactures parts will not be covered by the warranty. Hot Rod Jim’s is fully insured to protect your project while it is at our shop for work also including driving insurance if your project requires tuning while here. All projects will have a signed contract on hand and will need to be signed for upon pickup. If customers are unable to be contacted by the shop for more than 90 days without prior notice in contract the customer will be considered to have abandoned the project. Projects abandoned will become property of the shop and sold at public auction. Contact Hot Rod Jims' with any questinons reguarding your project.